Bath time is lots of fun in our home. Blake is a proper water baby and loves being in the bath and splashing around. We always make sure that Blake has some of his favorite bath toys ready for loads of fun.One of the things when it comes to bath time is making sure that we use high quality products on Blake's skin. Our new favorites are products from Skinfix which was exclusively released in Boots on June 17th. The Skinfix regimen are safe to use on delicate skin as they do not include soy, sulphates, parabens or phthalates. The products are ideal for your child's daily bath and skincare routine. Skinfix gentle hair and body wash (236ml/£12.99) is an ideal mild and gentle formula that cleanses children's delicate skin making them squeeky clean. 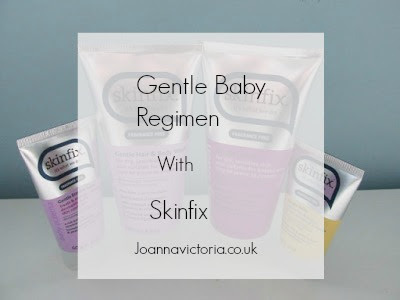 Skinfix gentle lotion (236ml/£12.99) is ideal for dry, sensitive and eczema-prone skin. This is an ideal product to use once your child/ren have had their bath and have been tried to help banish dryness and sooth skin. Skinfix Eczema Balm (60g/£14.50) is targeted for healing eczema with 0% water and is preservative free. The oils (Jojoba and sunflower) help to moisturise skin and beeswax helps to create a protective barrier. Skinfx nappy balm (60g/£6.99) protects babies delicate bottom since that area is exposed to wetness and irritants that can leave skin feeling raw and irritated. I think it's important to have a good high quality nappy cream as Blake has been prone to nappy rash especially when he has been teething. We love Skinfix products and highly recommend them to other parents who are looking for natural products that are good on baby's skin. The Skinfix Eczema Balm sounds ideal as my youngest suffers with eczema. I'm always looking for a good quality brand of baby products and these look fab! My daughter has eczema too. Will definitely watch out for this one too. B had awfully dry skin when he was born but we just ended up using olive oil! That looks really great. Although my babies are all bigger now they all suffer with really dry skin, so I will look out for this. I've never heard of this brand before, thank you! Skinfix Eczema Balm sounds wonderful and I could really do with this!